As an eighth-grade civics teacher, I am about to start my unit of study on the Executive Branch. To be honest, I’m a little scared. Strike that. I am very scared. “Why are you scared, George?” you may ask. “If you stick to the facts, you’ll have nothing to worry about,” In normal times, I’d agree with you, but these are not normal times. In 2016, a minority of the American people elected a businessman as their president. This businessman got elected by breaking the usual norms of politics. He railed against the establishment, but he also appeared to make comments that could be judged as racist, sexist, misogynistic, and anti-immigrant. It appeared to many who opposed him that he had tapped into a darker, less civil side of the American electorate. His election might be seen as a reaction to the eight years of the Obama presidency, the first African-American president in American History. With the rise of Donald Trump also came the emergence of the “alt-right,” an increase in hate crimes, the development of the #metoo and #times up movement, as well as the “America First” foreign policy, which has alienated many of America’s traditional allies. Teaching the campaign and election of 2016 was hard even if the teacher wanted to present an objective view because the goalposts of what was acceptable were constantly moving. Presenting a “fair and balanced” picture of the American political system in the classroom and in journalism was a constantly moving target, and for some, it seemed like it was a target apparently moving to the right. We are now one full year into the Trump presidency. 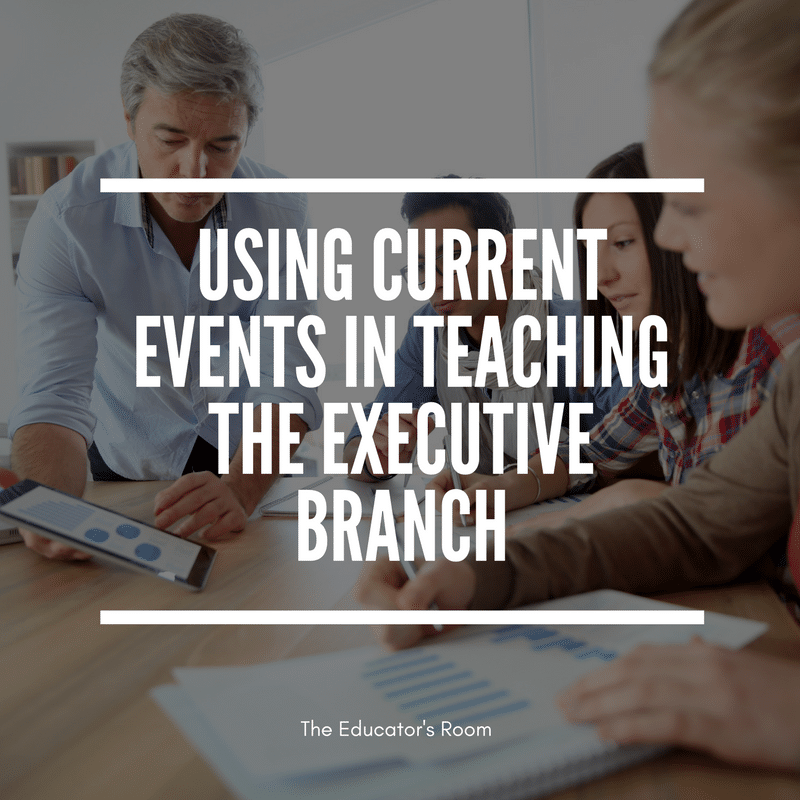 As we begin to tackle the topic of the Executive Branch, teachers may wonder if current events can actually be used to illustrate political concepts as we have in past years. In fact, it seems that only events well removed into the historical past can be used to demonstrate the Article II powers of the president and the checks and balances system enshrined in the Constitution that keeps the Chief Executive in check. We can discuss Richard Nixon’s role in the Watergate affair to illustrate the concept of “rule of law, “ a bedrock principle of our democracy that extends back to the Magna Carta. This idea holds that no one is above the law, not even those who govern. Examples of this concept rooted in current events cannot be used because it may reveal a political bias against the current administration. It seems inevitable that students of Civics in middle school or of Government in high school will want clarification regarding some of the events they may see on the news. In the 1990s, the Clinton impeachment filled the headlines, and as history unfolded within our living rooms, teachers saw a plethora of teachable moments on how the American Constitution worked and kept its officeholders subordinate to the will of the people. Nevertheless, teachers had to exercise good judgment, not because they would be accused of partisanship, but because of the salacious nature of the allegations against the president. The Starr Report that outlined the details of Clinton’s misdeeds were just too inappropriate for the secondary level classroom. Teachers were forced to respond with the phrase “go ask your parents” when asked why the president had been brought up on charges in the House of Representatives and put on trial in the Senate. As we watch events unfold today, teachers may be forced to offer up the same non-answer in order to avoid parental criticism for bringing adult-level content into their classrooms filled with adolescents, some of which may not be allowed to be exposed to such adult content. School policy and general consensus require teachers of Civics and government to keep their opinions to themselves, even if they are asked directly by a student what they think. Teachers must “stick to the facts” when discussing American government. They are directed to allow students to make up their own minds and to arrive at their own conclusions in an atmosphere of civil discourse, modeling for students how to communicate difficult topics and how to accept all opinions as legitimate and accepted. These standards are laudable in theory, but in practice, they are must more difficult to achieve. This standard is even more challenging when the administration in office has a number of “facts” that reveal flaws and violations of our nation’s long-accepted democratic principles. Members of the Trump team met with Russian operatives during the 2016 campaign. The President has not released his tax returns as every modern presidential candidate and the president have done. The President may be in violation of the Emoluments Clause of the US Constitution as he has not fully divested himself from his business interests. DNC emails were leaked to WikiLeaks, allegedly by members of the Trump campaign. Four Trump officials are under indictment or have pleaded guilty to various charges including money laundering and lying to the FBI. The president or his lawyer paid off an adult film star 11 days before the election to keep her silent about an affair with the president. Almost no one who started in the Trump white house is there now. Many key officials have resigned or been fired. According to the Washington Post, President Trump has made over 2000 false statements since taking office. There are three investigations ongoing into the possibility of collusion or obstruction of justice under his administration. Congress has achieved one major legislative goal since taking office: a corporate tax cut. The worst mass shooting and worst school shooting took place during this administration. A trade war with several of the closest trading partners of the US may be underway due to tariffs placed on goods such as steel and aluminum. The case may also be made that teachers are unable or unwilling to teach such important concepts as respect for others manners, inclusiveness, multiculturalism and civil discourse because the nation’s chief executive does not engage in these desirable behaviors. Teachers must look to other examples in American history to model these desirable qualities. Historical figures such as Martin Luther King and Robert F. Kennedy can be used to illustrate how to reduce conflict and prejudice between ethnic groups and disparate political viewpoints. The challenge in today’s political atmosphere is to teach the curriculum while making concepts interesting and increasing student involvement. Teachers want their students to be politically aware and active, even if they end up on the opposite of the political spectrum as themselves. Parents want to know that their children will have an equal voice, will not experience retaliation on the part of the teacher or other students, and that they can make their own conclusions without undue influence of the authority figure that is the teacher. It is increasingly difficult for the teacher to be an actor as well, though that’s what is called for as the political atmosphere in Washington and around the world heats up.